The owner of the Novel Idea Literary Agency is thrilled when former local boy and popular television show host Damian York returns to Inspiration Valley, North Carolina, to launch his new gardening book. But Lila is less than excited about the hubbub when she sees her mounting to-do list. Between planning York’s gala and sprucing up her yard for another event, she’s spread too thin—especially after she finds a skull buried in her flowerbeds. The 4th book in the Novel Idea Mystery series is a wonderful addition to the series. 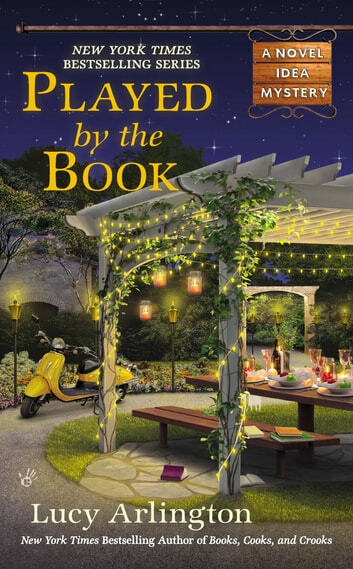 Lila Wilkins, a literary agent at Novel Idea is up to her eyeballs in work as she plans another big event for her job; a book signing & banquet in Inspiration Valley for a former local who has made it big as a gardener with a popular garden TV show. When Lila is convinced, read ordered by her boss, to become a participant in the co-ordinating garden tour, trouble follows. It starts when Lila uncovers a skull buried in her yard. Next, one of the other garden tour participants is found murdered. What will happen next? Does the skull have something to do with the murder & who is responsible? To add to Lila's worries there are problems with her relationship with Sean, her policeman boyfriend. I really enjoyed this book, Lila's handling of her problems & her successful unmasking of the murderer. My only caveat with the book was a small scene where Lila visits a pet store in Inspiration Valley. I would have been much happier if the store had been a pet supply store that sold pet supplies, not animals, especially puppies. I am looking forward to reading the next book in the series.